Bloomberg Sports Anchor Rob Shaw discusses the injuries and set return dates of seven players who could have an impact on your fantasy team in the second half of the season. Crawford has not played this season due to left wrist surgery in March and a partial UCL tear in his elbow in April. In 2011, he had a .255 average with 11 home runs and 56 RBI. Crawford is set to return to the Red Sox lineup on Monday against the White Sox. Ellsbury played in just seven games before being sidelined by a separated shoulder in mid-April. In 2011, he had an incredible season with a .321 batting average, 32 home runs and 105 RBI. Ellsbury should return Friday against the Tampa Bay Rays. Morrow had a great start to the season. In 13 starts, he had a 3.01 ERA, 1.00 WHIP and 67 strikeouts. He was placed on the 15-day disabled list on June 13 due to a strained left oblique. The Blue Jays are hoping that he will return to the rotation this month. Halladay has been sidelined since May 28 with a strained right lat. In 11 starts this season, he had a 3.98 ERA, 1.15 WHIP and 56 strikeouts. He is set to return to the mound Tuesday against the Dodgers. Stanton had surgery on July 8 to remove loose bodies from his right knee. This is a big loss for the Marlins, as he was hitting .284 with 19 home runs and 50 RBI. Stanton likely won’t return until late August. Kemp had an incredible start to the season, hitting .355 with 12 home runs and 28 RBI in just 36 games. However, he has battled a hamstring injury and was placed on the disabled list on May 31. He is set to return Friday against the San Diego Padres. Tulowitzki recently had surgery on his left groin muscle. He was batting .287 this season with eight home runs and 27 RBI. He likely won’t return to the Rockies’ lineup until mid-August. Coming up through the Rockies’ farm system, Chacin always surpassed expectations. Although he consistently posted an elite ERA in the minors, and was named as one of the organization’s top prospects by Baseball America and other scouting services, many figured he’d be a #3 SP at best. After all, even in single-A, Chacin never struck out a batter per inning, usually a mark that often foreshadows success. In 2010, called up to the majors by the team as an injury replacement, Chacin blew away expectations once again. Not only did he post a remarkable 3.28 ERA in his rookie season, he also fanned 138 batters in 137 innings. A pitcher with that kind of K rate who also induces as many groundballs as Chacin does has a very bright future. Street has had a rocky time of late. From 2005-2007, he looked to be one of the game’s elite closers. Then, in 2008, he struggled, lost his closer’s job, and was shipped from Oakland to Colorado in the off-season. In 2009, Street bounced back with 35 saves, a WHIP under 1, and a healthy strikeout rate. Going into this season, there wasn’t much reason to believe he wouldn’t be great again. Then, injuries took their toll, and Street struggled to find his rhythm. He ended the season on a high note with a strong September, but will hardly be forgiven for a lackluster 2010 campaign overall. Jimenez was a very good pitcher before the 2010 season. This year, he became elite. Overall, he posted 19 wins, a 2.88 ERA, a 1.15 WHIP, and 214 strikeouts. Jimenez gave up only 10 HR all season, a remarkable feat for a pitcher who plays half his games at Coors Field. Some might point to a slightly low BABIP and HR/FB rates as evidence he might regress. 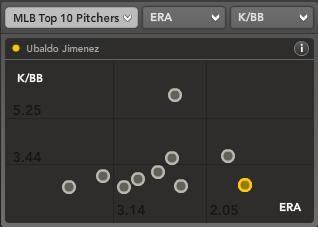 However, what’s particularly encouraging about Jimenez is his durability. He’s a freak of nature with an easy delivery that yields high-90s heat even into the late innings of a game. Invest. Hammel was the sleeper’s sleeper heading into the 2010 season. Throughout his career, his peripheral numbers keep getting stronger and stronger, and Hammel seemed on the verge of taking a next step. Instead, he battled injuries and ended the season with a disappointing 4.81 ERA. But look closer: His xFIP (a stat that runs along a similar scale to ERA but strips out defense, park effects and other factors a pitcher can’t control) is exactly the same as it was in 2009, at 3.81. Hammel is getting better at striking out batters and keeps the ball on the ground, similar to the way Chacin and Jimenez do. He’s still a breakout waiting to happen. 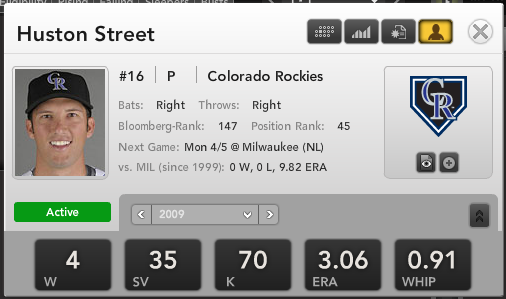 For more on Rockies pitchers, check out Bloomberg Sports’ Fantasy Tools. Gonzalez’s superb season didn’t come completely out of the blue, as many pundits figured he’d be a good sleeper heading into the 2010 season. But the most valuable fantasy asset in all of baseball? Not even the Oracle of Apollo saw that one coming. This year, Gonzalez lived up to his power/speed potential and racked up a huge line of 34 HR, 117 RBIs, 111 runs, 26 steals, and a .336 average. How much is he worth going forward? The question was the subject of debate here recently: Yes, he’s a stud. No, questions remain. Hawpe was the model of consistency before the 2010 season. In four consecutive years, he hit no less than 22 HR and no more than 29 HR. In that time, thanks to his prowess versus right-handed pitching, he hovered right around a .287 average. This season, everything collapsed. Hawpe didn’t even get to double digits in home runs, hit a lowly .245, and experienced injuries and withering playing time that led to his release. Hawpe ended the season with Tampa Bay and will look to bounce back in 2011 – with very modest expectations. Tulowitzki had quite a season in September alone, hitting 15 homers that month. Only five other shortstops in all of baseball hit 15 HR for the entire year. The strong finish more than made up for a broken wrist that cost him six weeks of action. Making just 529 plate appearances, Tulo finished with 27 HR, 95 RBI, 89 runs, 11 stolen bases, and a .315 average. His strong year plus the lack of talent at the shortstop position throughout the league makes him a first-round pick next season. Smith had about the same playing time in 2010 as 2009: 398 plate appearances to 387. Smith increased his home runs from 15 to 17. But if there’s any reason why Smith might slip under the radar, it’s a disappointing batting average. In 2009, Smith flirted with .300. This season, Smith’s average fell to .246. However, give him a dozen more hits and double his playing time, and Smith is still a candidate to hit 25 HR and bat .300. There’s reason to believe: Hawpe is no longer sharing playing time, and Smith’s batting average on balls in play was an unlucky .256 in his disappointing season. For more on Rockies hitters, check out Bloomberg Sports’ Fantasy Tools. Carlos Gonzalez of the Colorado Rockies is having a very charmed season. By season’s end, he’ll have roughly 35 HRs, 25 SBs, 120 RBIs, 110 Runs, and a .340 batting average. These numbers arguably earn him the title as the season’s Fantasy MVP and gain him consideration as one of the top few picks heading into next year. The case in his favor looks strong, at first glance. But beware. The young stud outfielder carries plenty of risk – and smart fantasy enthusiasts may be wise to stay away. Let’s start out with the obvious: CarGo has been the beneficiary of tremendous luck this season. The biggest knock against Gonzalez is his plate discipline. He strikes out 23% of the time and only takes a walk 6% of the time. This has added up to a .389 BABIP, which puts him only behind Josh Hamilton and Austin Jackson among players with regular playing time who have benefited from better luck on balls hit in play. Certainly, we can expect a higher-than-normal BABIP considering Gonzalez’ great speed, but not this high. Expected regression could knock anywhere from 40 to 60 points off that lofty .340 batting average. As for power, don’t expect 35 HRs again. Yes, he’s the beneficiary of playing in the tremendous hitting environment of Coors Field. But then again, CarGo is rather below-average in hitting for fly balls. His 37% rate is below average, roughly on par with Rajai Davis.or Alberto Callaspo. He’s knocked 35 out of the park this year thanks to the fact that nearly 21% of his fly balls have gone for HRs. Only Joey Votto, Carlos Pena, Jose Bautista, and Adam Dunn sport a higher percentage. At 6’1” and 210 pounds, Carlos Gonzalez carries less body mass than those other four to support such massive power. Carlos Gonzalez’ great luck in average and power has contributed to him reaching triple digits in both runs and RBIs. The team has another excellent player in Troy Tulowitzki, but the decline of Todd Helton and the departure of Brad Hawpe leaves the lineup dependent on youngsters like Ian Stewart, Dexter Fowler, Eric Young Jr. and Seth Smith to get on base in front of CarGo or reciprocally drive him home. Any slippage in the ability to get on base or knock balls out of the park will erode his ability to post elite context stats in runs and RBIs like the production he’s given this season. That’s part 1 of the case against Carlos Gonzalez. All of which might be acceptable but for two more glaring facts about Carlos Gonzalez: First, to put it simply, he’s never done this before. And second, his price tag in fantasy leagues is going to be through the roof coming off such a stellar year. Yes, he was a very fine prospect coming up through the minors, is only 24-years-old, and is still growing. But the road to superstardom for young elite players is rarely a linear curve upwards. There are ups and downs. Ask Matt Kemp, who was the fantasy pundit’s darling at this time last year. No amount of production this year can help us ferret out whether Carlos Gonzalez is one of the elite players who will consistently have one stellar year after another like other potential first round picks or rather is merely a fine player having a career season. We still need more evidence – especially in light of all the good luck factors described above that have contributed to his superlative year. Carlos Gonzalez has great upside, no doubt, and deserves to be honored for the season he is enjoying. But once the season completes, none of that matters going forward. The only question is what he’s going to do for an encore. Unfortunately, it seems likely that in drafts and auctions, the price of admission will be too high on this young player at a non-scarce position. Consider yourself warned. In the fantasy baseball lexicon, “platoon” is a dirty word. Few fantasy team owners want to hear that one of their players is being benched against either left-handed or right-handed pitching. But in leagues that allow daily lineup adjustments and enough roster room to accommodate extra batters, platoons represent a tremendous buying opportunity. Smith is a smooth-hitting left-handed batter in a crowded Colorado Rockies outfield. Because he competes for playing time with Carlos Gonzalez, Brad Hawpe, Dexter Fowler, and Ryan Spilborghs, Smith doesn’t play every day. That doesn’t make his playing time unpredictable, though. Throughout this season, Smith has consistently gotten starts against right-handed pitching. On those days, he’s been fantastic. In 56 games he’s started this season, Smith has posted an .840 OPS. To put that in context, it’s top 50 in the MLB this season, ahead of Alex Rios, Carlos Quentin, and Justin Upton, to name a few players who dwarf Smith in ownership percentage. The fact that Smith has been so valuable in games he’s started shouldn’t come as much of a surprise. Over the years, Smith has feasted on right-handed pitching. Since 2008, Smith has an OPS of .911 against right-handed pitching. Only 28 batters with at least 400 AB in that time frame can claim a better record versus right-handed pitchers. He’s bested players like Ryan Braun, Chase Utley, and Evan Longoria in that category. The reason that Smith doesn’t play every day? Well, a crowded Colorado Rockies outfield is one factor. Another is that Smith doesn’t fare as well against left-handed pitching. His career OPS versus lefties is .622, albeit in a relatively small sample size. Still, given the opportunity to play Smith on days he’s starting, what fantasy owner couldn’t have used these stats to date: a .281 AVG, 11 HR, 31 RBI, and 36 Runs. The stats are even more impressive when paired with a player who might have been activated in place of Smith when the Rockies outfielder had the day off. Let’s assume a team owner has gotten 56 games from Smith and another 45 games from a replacement-caliber player. What kind of stats would be required from Smith’s fantasy platoon partner to match Jayson Werth’s 2010 production of a .292 AVG, 15 HR, 64 Runs, and 56 RBIs? Answer: Not much. Werth is owned in nearly every league, whereas Smith is owned in less than 10% of leagues. Pairing Smith with another discounted player like J.D. Drew or Jason Kubel offers aggregated production that can potentially surpass the offerings of a player like Werth. Consider this a market inefficiency if you’re in a league with daily transactions. For years, real-life MLB managers have been exploiting platoons. For owners in roster-flexible leagues willing to do some daily research on match-ups, having a fantasy platoon can be just as rewarding. Should You Sell High on Ubaldo Jimenez? If the season ended today, Ubaldo Jimenez would win the Cy Young award easily on the strength of a 13-1 record, a 1.60 ERA, a 1.04 WHIP, and 95 strikeouts. He’s been the top player in fantasy baseball this year. Yet there’s a creeping suspicion that he may be a little overvalued. He’s averaging about 7.99 strikeouts per 9 innings. That ranks him 26th among starters with at least 70 IP this season. He’s behind Colby Lewis, Ricky Romero, and Gavin Floyd, to name three pitchers with much less star power. He’s averaging 3.03 walks per 9 innings. That ranks him 54th among starters with at least 70 IP. Among the pitchers walking batters at a lower rate are Brian Bannister, Kyle Kendrick, and once again, Gavin Floyd. He’s averaging 0.34 home runs per 9 innings.That ranks him 6th among qualified starters. However, only 4.4% of his fly balls are going for home runs. His career rate is 7.6%, and he plays half his games at Coors Field. That’s very likely to regress. His strand rate is 87.8%, meaning 87.8% of the runners he puts on base don’t score. That’s largely a function of fortuitous timing (pitching abnormally and probably unsustainably well with men on base), as well as unusually strong bullpen bullpen. That’s also the luckiest rate in the entire major leagues. Add it together, and Jimenez’s xFIP (a measure of ERA independent of various luck factors) is 3.64 — more than two whole runs higher than his real ERA. For the rest of the season, Bloomberg Sports projects Jimenez to produce 9 wins, a 3.39 ERA, a 1.21 WHIP, and 112 strikeouts. People toss around the phrase, “regression,” but what does it really mean? 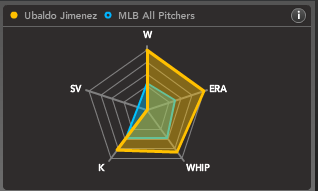 If Jimenez’s peripheral stats indicate a great deal of luck, should owners sell him now? First, nobody should succumb to the “gambler’s fallacy,” or an expectation that Jimenez’s great luck thus far will be evened out by unusually poor luck upcoming. Regression only means that based on peripheral stats, one should expect an ERA at about 3.3-3.6 from this point to the end of the season — and not that he’ll end up at that result at season’s close. An ERA at this level is still phenomenal. Bloomberg Sports projects him as the third-best pitcher in baseball from this point forward. Second, deciding whether to sell him “high” depends on context. If you own Jimenez, do you still need great pitching? If so, it’s going to be hard to do better than what he’ll give you. What’s the trade offer? The presumption that he’s a sell-high candidate because an owner can trade Jimenez for a comparable pitcher like Josh Johnson, plus get something extra, although in reality, it’s not a slam dunk that a Josh Johnson owner would make this deal. That said, perhaps there’s still an opportunity to trade Jimenez for more than what he’s really worth, to an owner who needs a pitcher and is willing to exchange a batter. In the preseason, hardly anyone gave any thought whatsoever to drafting a pitcher with the #1 overall pick. But now that Jimenez sits atop fantasy player raters as the best in baseball, it’s perhaps conceivable that a pitching-starved team trades Hanley Ramirez, Albert Pujols, Ryan Braun, or another top-notch batter for Jimenez. Lastly, owners shouldn’t be entirely sure that selling Jimenez now is the smart course of action, because there’s no guarantee that the Rockies’ ace really is lucky. Sure, all the best sabermetric stats at the moment indicate he’s doing better than he really deserves, there’s always the chance that a player defies the odds for longer than a few games or a couple of months; they might even keep the good times going all season long. For example, if I was making the case that Jimenez really isn’t quite as lucky as he seems, I’d point to the fact that his command improves when batters get on base. (His walk rate goes from 4.03 with the bases empty to 1.84 when he’s pitching from the stretch.) In turn, his xFIP in these situations drops nearly an entire run. This could partly explain why his strand rate is so tremendous. With men on base or in high leverage situations, Jimenez simply performs better. That’s probably not sustainable over the long haul, but it is possible. Plus, peripheral stats do a good job of telling us general trends among the general population of players, but can often miss the mark when pinpointing individuals. What’s the expected batting average on balls hit in play on a pitcher whose average pitch velocity is at least 96 miles per hour? Hard to say, because there’s only been one pitcher this past decade whose reached those heights. Jimenez, of course. So if you’re thinking about selling high on Jimenez, remember to consider context when making or fielding offers. Getting a big haul would be great. But don’t trade him just for the sake of trading him. For more on Ubaldo Jimenez and other pitching aces, check out Bloomberg Sports’ Fantasy Tools. The Rockies are expected to start the season with closer Huston Street on the disabled list. Street has been battling shoulder stiffness this spring, and suffered a setback while playing catch on Tuesday. He underwent an MRI on Wednesday, and although the results were clean, he is likely too far behind on his throwing program to be ready by opening day. Right-handers Rafael Betancourt and Manny Corpas would seem like obvious replacements, but both have issues of their own. Like Street, Betancourt has missed time with a shoulder issue this spring. Corpas, on the other hand, missed the second half of 2009 with a bone chip in his right arm. More likely, the Rockies will turn to left-handed former starting pitching prospect Franklin Morales to fill in for Street. Most baseball fans remember Morales, 24, as a promising rookie starter on the 2007 National League championship team. He dealt with a back injury and inconsistency in 2008, and had a shoulder problem of his own in 2009. Once healthy, he rejoined the Rockies as member of the bullpen. When Street went on the DL in September with biceps tendinitis, Morales closed out six games in his absence. He made 40 appearances last season (38 in relief) and had a league average-ish 4.50 ERA. He also saved seven games in eight chances. Despite the ho-hum ERA, Morales showed traits of a good relief pitcher. In his brief time as a major league starter (72.2 innings), Morales had an unimpressive strikeouts per nine innings rate (K/9) of 5.4. Meanwhile, as a relief pitcher he struck out a batter per inning (32 strikeouts in 32 innings). He also allowed just one home run in 32 relief innings. The knock on Morales has been control. In his major league career, he has a walks per nine innings rate (BB/9) of 4.6. In 2009, his BB/9 was over 5.0. While his control remains an issue, velocity is not. As a starter, Morales averaged low 90s on his fastball; as a reliever, he topped 93.0 mph, on average, in 2009. Outside of his strikeout rate, Morales currently offers little to fantasy players. With a league average ERA and poor walk rates, his average draft position is just 335.5. That said, as a the potential closer on a promising team, those flaws become less relevant, and Morales becomes a serious late-inning target. Grab Morales at the back end of your draft, especially in a deep NL-only league or a larger mixed league. Given Street’s injury history, as well as the medical and performance questions facing the rest of the bullpen, Morales presents the potential for some cheap save opportunities – and maybe more. For more on Franklin Morales and other potential sleepers, check out Bloomberg Sports’ fantasy kits.